The Lun-class Ekranoplan floatplane was one of the most distinct designs to emerge from the Cold War. The aircraft was designed around the idea known as "wing-in-ground" effect, which basically allowed for an increased weight aircraft to utilized the low-altitude lift over water for increased range and better fuel economy. 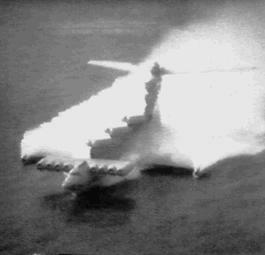 In essence, the aircraft would skim the surface of the water after achieving take off and utilize this lift for the duration of the flight. This effect can be commonly observed in seabirds flying low, scouting for prey. The bird seems to effortlessly skim across the surface of the body of water without the need to flap its wings for some time. This same idea was brought to bear in the Lun-class flying boat, of which only one was ever produced and operated with the Soviet Navy. The primary goal of the Ekranoplan design was to submit a system that could operate under radar by staying close to the surface of the earth, where "clutter" signatures were more apparent. Make no mistake - the Ekranoplan was a large aircraft for its time. The design was an achievement by Rostislav Evgenievich Alexeev but was by no means a new concept. Wing-in-ground (WIG) effect aircraft were being tested as early as the 1930's, most notably by the German firm of Dornier. The Ekranoplan was unique in that it A) was a successful design attempt that was used operationally and B) it relied on turbojet power, something not afforded the systems of earlier attempts. The Ekranoplan entered service with the Soviet Navy in 1987 with the designation of MD-160, operating in the Black Sea. The system was powered by no fewer than 8 turbojet engines mounted on a variable forward canard system (four per side) that would be controlled by the pilot during take off and could be leveled during flight. The fuselage was designed with the boat hull-style look common to many World War Two flying boat aircraft. Wings were mounted low at fuselage center and a V-shape high tail section rounded out the design components. The cockpit was fitted just forward of the wing roots and the entire system was crewed by fifteen personnel. Operating as an anti-submarine variant, the MD-160 was fitted with six anti-ship missile launchers across the top of her fuselage. Each launcher was designed to fire the SS-N-22 Sunburn naval missile munition. Additionally, a single 23mm cannon was also afforded the crew for self-defense. A floatplane flying hospital was planned from the MD-160 airframe, though the collapse of the Soviet Union in 1989 did the idea in. At present, it is believed that the Lun-class Ekranoplan is not in any type of operational service with the Russian fleet operating in the Black Sea. An impressive aircraft to say the least, the Ekranoplan was a major design challenge met and superceded by a nation that knows large aircraft quite well (see Antonov AN 225 entry). The Lun development programme started in 1970, but assembly of the first Lun did not start until 1983. On 16 July 1986 it was launched into the Volga river. Spring 1987 trails started on the Caspian Sea. The first Lun was designed and built as a missile launching strike craft. The second Lun was under construction during the collapse of the Soviet Union and work stopped. The design of the Lun is very similar to the KM (Casp A), but it is smaller, has a low wing and no fin mounted engines. It is equipped with eight NK-87 turbofan engines. Summer '97 Russian television showed the Lun half sunk in the water at Kaspiisk Naval Air Base. The Lun (Russian: "Hen Harrier") (NATO reporting name: "Utka"; Russian: "Duck") ekranoplan Wing-In-Ground effect vehicle was an extremely unusual aircraft designed by Rostislav Evgenievich Alexeev and used by the Soviet & Russian navies from 1987 to sometime in the late '90s. Wing-in-ground-effect aircraft use the extra lift of their large wings when in proximity to the surface (about one to four meters). It is also interesting to note that this aircraft is one of the largest ever built, with a length of 73m, rivaling that of the Hughes H-4 Hercules "Spruce Goose" and many modern jumbo jets. The sole vessel of her class, MD-160 entered service with the Black Sea Fleet 1987. Eight Kuznetsov NK-87 turbojets were mounted on forward-located canards, each delivering 127.4 kN (28,600 lbf) of thrust. MD-160 had a flying boat-like hull with a large deflecting plate at the bottom of the hull to provide a "step" for takeoff. The aircraft was equipped for anti-submarine warfare. It was therefore fitted with six missile launchers, mounted in pairs on the dorsal surface of the fuselage, and advanced tracking systems mounted in the nose and tail. A development of the Lun was planned for use as a mobile field hospital, one which could be rapidly deployed to any ocean or coastal location. Work was begun on this model, the Spasatel, but budget cutbacks mean that it has never been completed.